Natural colours derived from fruit and vegetables. No artificial colours or flavours. No preservatives. Vegetarian Society approved. 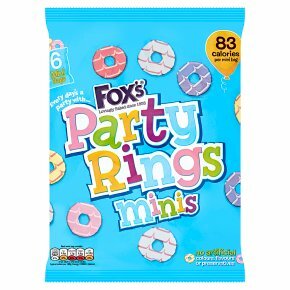 Suitable for vegetarians.Make everyday a party with Party Rings. These colourful, crunchy, mini iced ring biscuits are the perfect sweet treat for fun-loving little fingers!